The New-Tech™ 6-13 XL ADC Plus can be used for almost any welding application. The shade level can be adjusted from DIN 6 to DIN 13, making the helmet very versatile. The helmet features a grinding mode which allows the ADF screen to be switched off for grinding and has a sensitivity and delay function. ADC Plus Technology - Eye does not need to adjust to different shades. 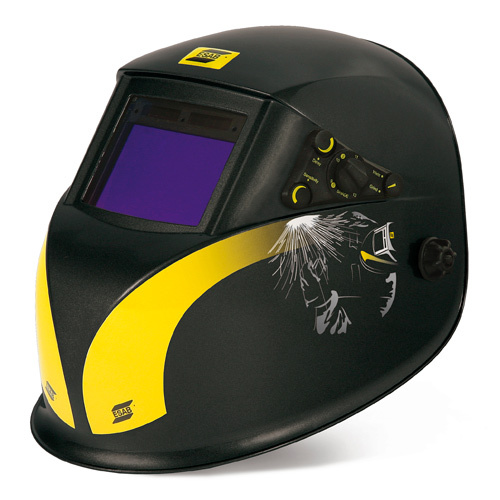 This reduces eye fatigue as well as increasing comfort for any welder. Increased color definition - offers superior color definition in both the open and activated state, allowing the welder to better see the LED displays on machines and equipment, while also identifying heat definition on the actual weld. ESAB’s series of New-Tech ™ ADC Plus helmets are ANSI approved.